There are few things in life that seem to hit on all your passions at one time. So when those things come around, you should grab onto it, sink your teeth into it, and never let it go. So when I heard about MacGillivray Freeman’s National Park Adventure 3D IMAX Film coming to Raleigh I did just that. This film promised to hit on 3 of my biggest passions: America’s National Parks, watching movies, and spending time with my family! 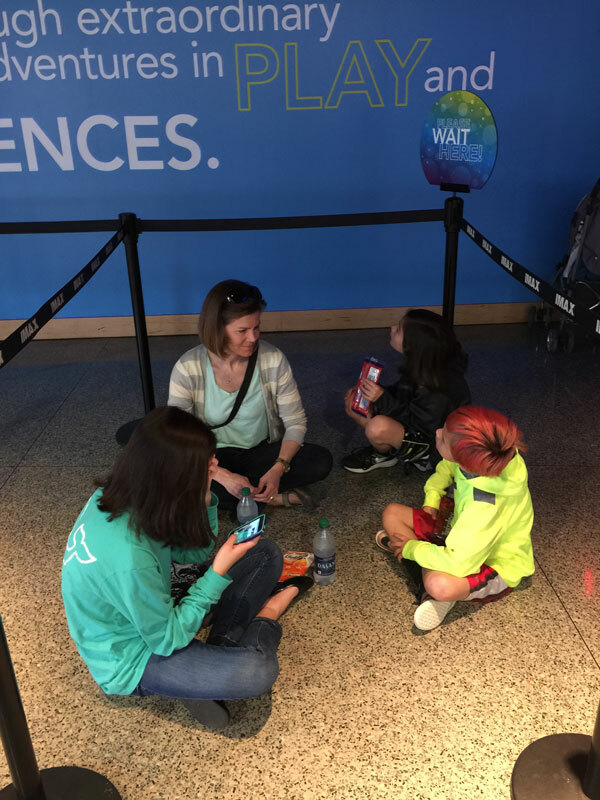 The Wells Fargo IMAX Theatre at Marbles in Raleigh is a pretty awesome IMAX theatre with decent parking options and all the fantastic sound and screen quality you can expect from the IMAX brand. In recent years, around where I live, there have been a number of other IMAX and “Big Screen” options closer to my house and I have typically shifted my business to them. But for this film, the theatre at Marbles was the only one showing it. With IMAX films on the weekend, there’s no telling how busy it will be. And in the beginning of the week there was a forecast of rain so I decided to not take a chance and buy the tickets online. While the cost of the tickets were very reasonable: $7 for adults and $6 for children, the $2/ticket internet convenience fee seems pretty ridiculous. It astounds me how buying tickets in advance, giving a theatre a heads up on future demand, and using your own paper and ink for tickets warrants a convenience fee. Anyway, with 3 adults (my daughter no longer qualifies for kid rates which is scary and sad to me at the same time), and 2 kids we paid the extra $10 and secured our tickets early. We arrived at the theatre around 1:35 for a 2:10 PM showing and the kids immediately found the display for the film. I am already catching glimpses of the not so distant future when the kids refuse to pose in front of things like this but for now, I am basking in this. We were assured by employees working the counter that out of the 250+ seating capacity in the theatre, only 40 tickets were sold and indeed, every seat in the IMAX theatre was a great seat. We decided to not take our chances because…well..if I am being totally honest…I don’t like to be second at anything. The doors opened at 2:00 PM and we took our seats: third row from the top, dead center. 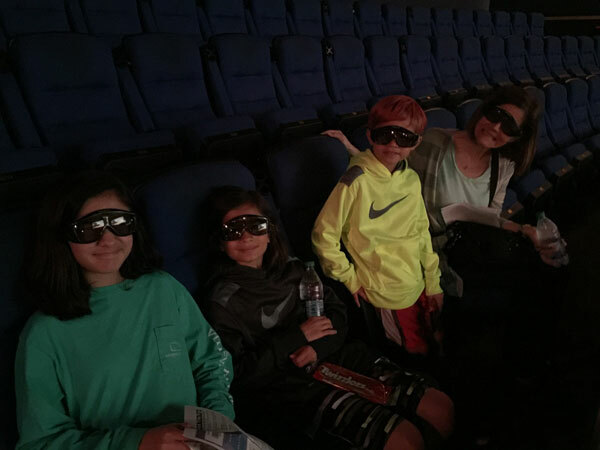 We put on our 3D glasses and waited for the show! One of the things that we loved while waiting for the show was the pre-show screens were asking the audience to name parks based on pictures and brief descriptions. My kids were pretty excited to not only answer them correctly, but they were excited that we had visited all of them! The parks highlighted pre-show were: Great Smoky Mountain National Park, Cape Hatteras National Seashore, Wright Brothers Memorial, and Blue Ridge Parkway. I was a happy dude knowing that the commitment of my wife and I to visit these parks was paying off! 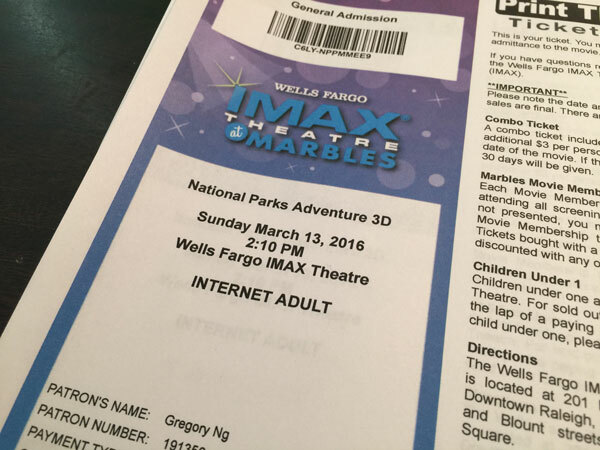 Was the MacGillivray Freeman’s National Park Adventure 3D IMAX Film any good? The film followed 3 adventurers as they travelled cross country on a National Park adventure. There was a climber, a photographer, and an artist. The film used their road trip as a backbone to highlight the history of the National Park system (specifically the work and vision of John Muir and President Theodore Roosevelt). It had crazy gorgeous footage of the amazing landscapes of our country. A lot of the footage were timelapse shots. Look out in particular for a timelpase shot of the Yosemite Valley where the clouds above the treeline seem to zig zag through the valley in a boustrophedous manner. Clearly the shot of the film. The soundtrack was noticeably impactful and matched the amazing footage in a way where I couldn’t decide which was enhancing the other. I loved the use of Jeff Buckley’s “Hallelujah” as well as James Bay’s “Hold Back the River”. 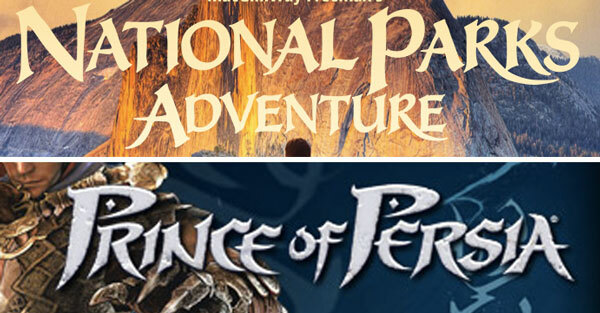 For a film that touts itself as a “National Park Adventure”, it didn’t even scratch the surface of all the National Park Service has to offer. Sure, it did the mandatory “From the blah blah blah, to the blah blah blah…” montage to communicate that there are tons of variety but it really made it seem like the National Parks in Utah were the most amazing. Don’t get me wrong: The Utah parks ARE amazing. Zion National Park IS my favorite National Park of all time. But the plotline was heavily weighted to just a small subset of National Parks. Ok. I know that there is no way anyone could cover the full breadth of the park system in 40 minutes. Even if they just said the names of every site (and dedicated 10 seconds to every name) the movie would take 68 minutes. 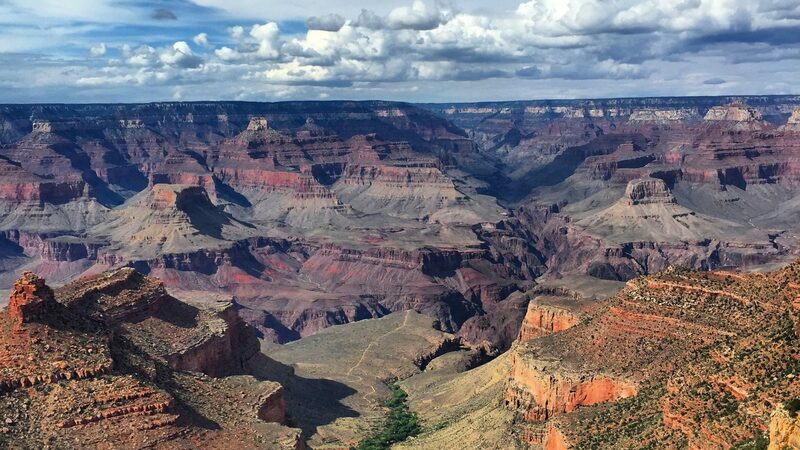 The real issue for me is not that it focuses on a few amazing parks — (most notably, Canyonlands, Grand Canyon, Rocky Mountain, Yellowstone, Glacier, and Redwoods) it is that the name of the film makes it seem like an overview of the full roster of amazing sites. The piece of work that comes closer to this desire for me is of course the Ken Burns PBS Miniseries: National Parks: America’s Best Idea which I highly recommend as well. Unfortunately, those were not shot in IMAX. Now if only they could blend these two together…. I realize that this is a super trivial thing to complain about so in recognition of this fact, let me hit you up with an even more trivial complaint: the typography in the title sequence is atrocious. It looks like the instruction video before a Prince of Persia ride at Disneyland. In a nutshell, if you love beautiful things, nature, our National Parks, our prairie dogs then you should go see this film. If you hate all that is right with our country, stay away. We left the theatre excited to go visit more National Parks! 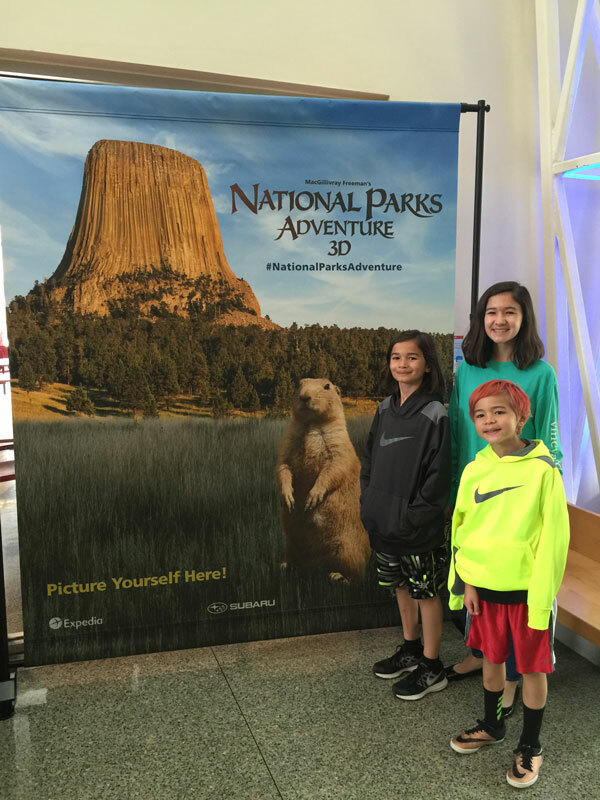 With our Everglades National Park trip coming up in 2 weeks, our family has already started thinking about the cool experiences we will have there! 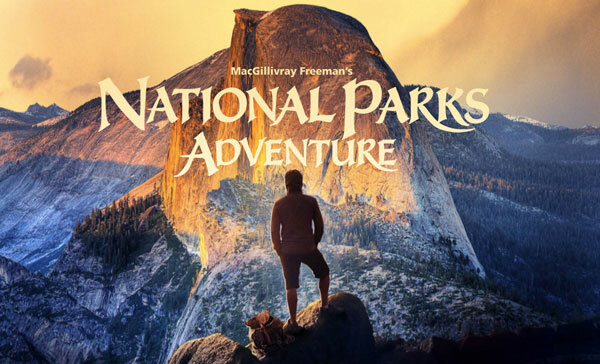 Did you see the MacGillivray Freeman’s National Park Adventure 3D IMAX Film? If so, tell me what you think of it in the comments below!